West Pointe Office Park is a professional office park situated on 12 acres, in Oshtemo Township, Michigan. It is conveniently located within the I-94 corridor of the greater Kalamazoo area, at the corner of M-43 (West Main) and US 131. Currently, six of the proposed nine 10,000-square-foot professional office buildings have been completed. The development sits adjacent to a wooded residential condominium development–a setting that provides for a corporate park environment. Suites ranging from approximately 1,000 square feet up to 10,000 square feet available. 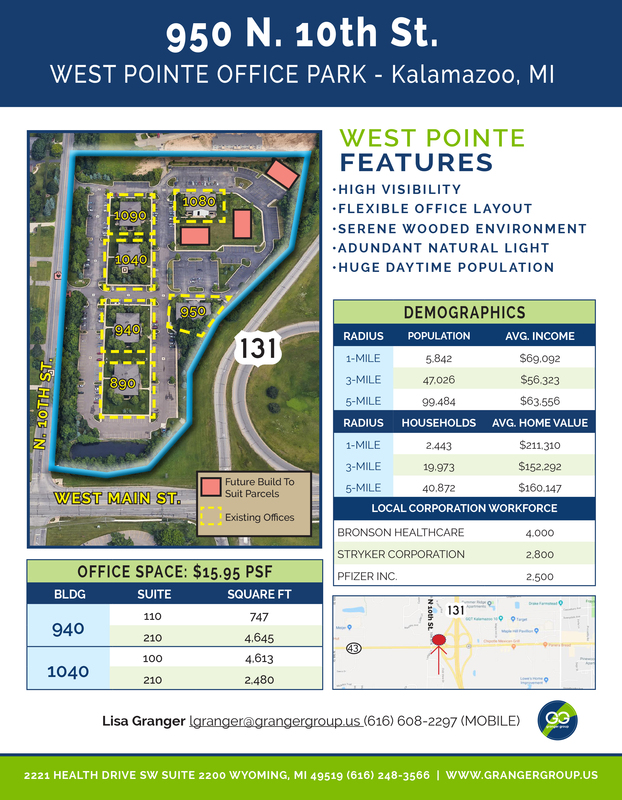 West Pointe Office Park delivers all of the amenities found in a larger office complex, with the benefits of smaller, more personalized spaces, by utilizing a relatively smaller building footprint. Each 2-story building features numerous windows to introduce abundant natural daylight into the office and high-efficiency HVAC systems, which combine to reduce lighting and heating costs.